Tick three of the UK’s most popular locations off your bucket list with this affordable day trip from London. See the royal town of Windsor and soak in mesmerising sights of Windsor Castle, the venue for Prince Harry and Meghan Markle’s wedding, see the world-famous Stonehenge and the university town of Oxford. Accompanied by an expert guide, you will visit all three destinations with the flexibility to visit the attractions that suit you. Entrances are not included in the price of this tour, but can be purchased on the day. The town of Windsor is famous around the world for being the home of Windsor Castle, official residence of Her Majesty The Queen. 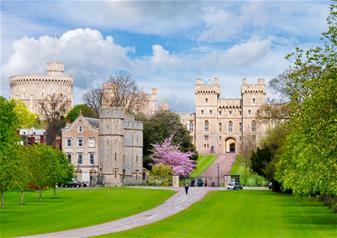 Windsor sits on the River Thames and is a quintessentially English town with its cobbled streets and quaint tea rooms. The picturesque Windsor is rich in history, culture and heritage and it’s no wonder why it tops the list of must-visit UK locations for most tourists. The 5,000 year old Stonehenge monument is one of Britain’s most intriguing and famous landmarks. Sitting atop rugged Salisbury Plain, Stonehenge’s origins still continue to baffle experts and visitors alike. We don’t know who put these huge rocks there, or why but you can have the chance to piece together the evidence and try to work it out for yourself! Theories stem from a Bronze Age burial ground to an astronomical clock, so do some investigating of your own as the tour travels to this famous location. From Stonehenge, the tour will move on to the university town of Oxford. Take a stroll through the scenic cobbled streets and get acquainted with the historic city during a guided walking tour. See the Colleges of Oxford University, the oldest university in the English-speaking world! Alumni include T.S. Eliot, Hugh Grant and Bill Clinton – a star-studded line up! You will also see the 17th century Bodleian Library, where countless scholars have studied over the years.